By conservative, reliable, objective, and preliminary estimates, the United States could generate at least $660 million annually – $26.4 billion over four decades – by building and operating faster, more frequent, more dependable, and more highly integrated passenger rail service in four corridors: The Northeast; the Chicago Hub; California; and the Northwest. Numerous studies by a variety of national and international organizations and government agencies suggest that the actual cost of building and/or improving passenger rail service lines is significantly less than the cost per mile of other modal alternatives. In fact, in many corridors, passenger rail is the only feasible option for adding capacity, given the practical constraints facing aviation and highway expansion. Further, by integrating improved, higher speed intercity passenger rail service into the existing transportation system, major issues of congestion, mobility and economic inequality can be addressed. The U.S. Census Bureau estimates that the population of our nation will grow by more than 100 million over the next 40 years. A sizeable portion of America’s present population is already searching for mobility alternatives, and demographers predict that desire will only continue to grow in the face of rising fuel costs, environmental concerns, senior citizen mobility issues, and a steady growth in urban population centers brought on by Millennials and Empty Nesters (Davis, Dutzik, 2012; Baxandall, 2012; t4America, 2011). All of these influences are putting pressure on America’s transportation infrastructure, which, by most credible measures, is hampered by deferred maintenance and inadequate capacity. Since the early 1970s, transportation policy makers have recognized the need to maintain a competitive, multi-modal interurban transportation system. Unfortunately, the nation’s investment and policy development has not kept pace with either demand or expectation, thereby constraining the transportation system and limiting consumer choice. In the 1990s, beginning with the Clinton administration and continuing through the administration of George W. Bush, serious bipartisan efforts were undertaken to address the needs of the nation’s transportation infrastructure – including its intercity passenger rail corridors. But midway into the first decade of the 21st Century a public policy paralysis took hold that virtually destroyed the bipartisan commitment to infrastructure. In the midst of this upheaval, both an outgoing administration and an incoming administration attempted to breathe new life into the policy discussion on intercity passenger rail in America. In 2008, President Bush signed into law the Passenger Rail Investment and Improvement Act (PRIIA), which authorized an aggressive set of initiatives that had the potential to redress the growing passenger rail mobility challenges facing the nation. Under the dark clouds of one of the world’s most severe economic crises, the new administration of President Obama pushed through Congress in 2009 a massive economic stimulus package containing more than $7 billion in rail investments and the outlines for a nationwide strategy to give “80% of Americans access to high-speed rail within the next 25 years” (Obama, 2011). Between 2009 and 2011 Congress approved more than $13 billion in funding for intercity passenger rail improvements, and the Administration promised at least $50 billion more over the next four years. By the end of 2010, 39 states, the District of Columbia, and Amtrak submitted applications requesting more than $75 billion – well in excess of the available funding – for projects and corridor improvements in every region of the country. But the Congressional elections of 2010 eliminated virtually all bipartisan supported and by the spring of 2011 Congress severely cut funding for the intercity passenger rail initiative, causing the Federal Railroad Administration (FRA) to disperse a little more than $10 billion in grant funding to 32 states and Amtrak. Additionally, Congress eliminated all future funding for the Administration’s efforts to jump-start high-speed intercity passenger rail, and placed severe constraints on Amtrak’s ability to meet the growing demand for even its form of slower intercity and long-distance service. In light of this history and the prospects for the future, policy makers are faced with the question: What is the cost of not building an improved intercity passenger rail system? 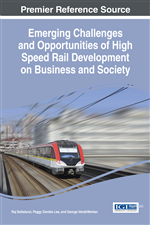 To answer this question, this chapter examines intercity passenger rail service from the perspective of a highly integrated transportation service that offers competitive door-to-door travel time comparable to other intercity transportation modes operating in particular corridors at distances of 100 to 600 miles. This chapter addresses the cost to America’s transportation system, and the nation’s environment, economic condition, and energy supply if aggressive efforts are not made in the very near term to improve the U.S. intercity passenger rail system on par with the systems now operating in Europe and Asia.